Use a rubric assessment to grade student work side-by-side with an embedded copy of a Google Doc, video recording, or other GSuite tool. To create an assessment, select Assessment from the lefthand menu. Then select Create Assessment. Select the Rubric assessment option, enter the Assessment Name, Assessment Type, and desired Grading Scale. Enter a Title for your first rubric descriptor. In the box below the title, enter a Description of the descriptor. If you are attaching a standard, the definition of the selected standard will populate into the box for you. You have the ability to adjust the text once it is added. ***If you have chosen a points grading scale, enter the desired number of points for each level, and enter the criteria for each descriptor. You can remove labels or add labels if needed. When grading off of this rubric, you will have the ability to adjust the scores in addition to using the point values in the rubric. When you create a new descriptor, your scoring set up from the previous descriptor will carry over. Every Rubric-Based assessment will require at least one rubric descriptor. You may add as many descriptors as you need. You may also link one standard to each descriptor. This will provide you with the ability to view student progress each time they are assessed on the standard. ***Please note: This assessment will not appear in the the Standards Gradebook if a standard is not linked to each descriptor. Each time you create a Descriptor, it will be added to your descriptor bank. When adding the Descriptor Title, you can type the first 3 letters of the descriptor to find ones that you have already created, starting with those 3 letters! 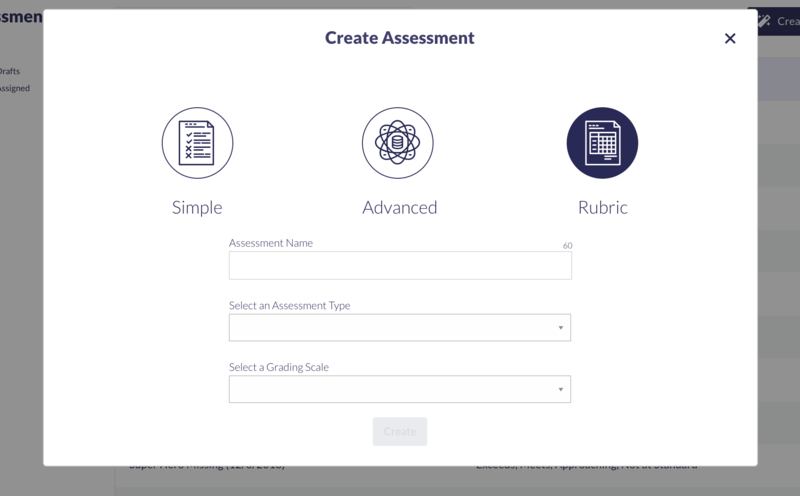 Rubric Based Assessments allow users to attach assessment related materials, including resources from Google Drive or One Drive, for students to access while taking the assessment. To do so, select Choose File under Attachments and choose the desired attachment type. Students can access non-Google materials you have shared by clicking the link under Teacher Attachments. The first Google Doc you share will appear below the rubric right in the assessment. Students can edit the Google doc within the assessment (Unless it was shared as View Only), but for any other type of document submission, they must click Attach and upload their work before submitting for a grade. They also have the ability to Save & Exit if they would like to continue the assessment at a later time. Once completed, students must click Submit. Once a student submits their assessment, they lose editing rights to any attachment within the assessment. Unless multiple attempts are allowed, students will not regain editing rights until the assessment is graded. Upload File: Teachers and students can browse and upload documents, videos, photos or other files stored on their device. This includes videos or photos in the camera roll on iOS. Link: a link to a web resource. Video: recorded live from your device (iOS devices not currently supported), or from your device hard drive. YouTube: Attach a link from a Youtube video. Audio: recorded live from their microphone (iOS devices not currently supported), from their device hard drive (iOS devices not currently supported). Google Drive: add resources already in the student's Google Drive. Microsoft OneDrive: add resources already in the student's Microsoft OneDrive. To assign the Rubric Based Assessment, please access this article HERE for step by step directions.